If Downton Abbey hasn't lived up to your expectations since the end of season one, then you need to pick up Kate Williams' The Storms of War, which is the novel that Downton would have been if it had more historical insight and research behind it and less of the over-the-top drama. It is 1914, and Celia de Witt is a privileged 15-year-old living a charmed life with her English mother and German father. But when war breaks out, the family quickly falls apart - her brother Michael heads off to war, her sister Emmeline runs away to London, her father is betrayed by the country he has grown to consider his own, and her mother collapses in on herself. Celia is left to try and fend for and find herself in a world that is disintegrating around her by the minute. From its brutal opening chapter, which recreates an image of the First World War we've all heard about and which never gets any less heartbreaking, to its surprise, shocking final pages, The Storms of War is a stunning novel recreating a time when Britain was turned upside down. Williams is a historian and you can tell she knows her stuff, although she cleverly folds her research into the narrative of the book, never once taking the reader out of the story to inform them about a particular historical facet. Williams covers the class system (more on that in a bit), sexuality, women's rights, pacifism and industrial progress in a thorough and thoroughly absorbing way. The characters within The Storms of War are all sympathetic and interesting, from the below-stairs household staff to the de Witts themselves. Celia is our eyes and ears into the pre-war world, as well as the horrors of France (along with Michael) and the changing face of London. As she travels from place to place, first just visiting her sister in the capital to then driving wounded soldiers to hospitals in France and then back to London and finally to her family's country estate, we see her change and grow. But while change is afoot in many places in the novel, I found it fascinating that so much of the class system stayed in place during the First World War. Emmeline, who runs away from her family to London, is still snobbish at the thought of anyone of her class having a relationship with someone of the serving class, and even Michael, sweet, dear Michael, automatically snaps back into his role as someone of the upper class when he is afraid or uncertain. It is only Celia who wonders why class matters so much when the world is being destroyed around her, but as a reader, I could see that the class system was something that made sense to people when so many other things didn't. 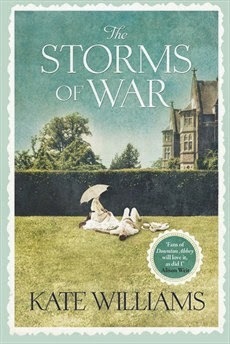 The Storms of War is billed, on my proof at least, as Downton Abbey meets Atonement, which I thought was a tall order before I read it. I now firmly believe The Storms of War meets its billing, and have high hopes that its sequel will be equally absorbing, and told with the same respect for its time period and for its characters. •The Storms of War is out on July 3, 2014. I had high hopes, but it exceeded them. The only bad thing about reading it is the wait for the sequel!